Everyone wants big, showy arms. They’re often on display. The ladies love them, and a bulging set of guns makes you feel great. One mistake people often make with arms though is to pile too much weight on the bar and use momentum…especially with curls. Check your ego at the door, drop the weight to one that you can lift without swinging it, and focus on your target muscles. The mind-muscle connection is all important in both bodybuilding and strength training. Get in tune with your body to stimulate growth. Another big mistake is doing too many sets. Arms don’t need 20 sets. Ten to 12 good, quality and focused sets per muscle group is more than enough. Lastly, your arms are working all day, especially if you do manual labor in your job, so change up your routine regularly to keep your arms guessing. Switch between compound and isolation movements, low and high reps, straight sets and supersets. You just can’t beat the old favorites for packing on muscle. If you’re in a bulking phase, these lifts should form the majority of your arm training. The lifts in this workout are simple, heavy and no-messing arm shredders. Barbell curls. The good old bicep curl is the first lift you think of when you’re a kid. 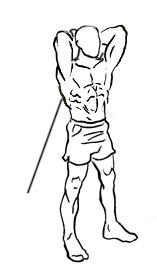 To get biceps like Popeye, the barbell curl should form the basis of your bicep training. It is the most intense and heaviest lift for your guns. Use Sheer Strength Labs NO2 Nitric Oxide Boosters to get the blood pumping into the muscles to maximize the impact of your curls. Take a grip slightly wider than shoulder width and curl the bar strictly for a squeeze at the top, before a nice, controlled return. Don’t let your elbows stray forward, this takes tension away from the biceps at the top. If your wrists can’t handle a flat bar, try an EZ curl bar, but it’s not as effective. Preacher curls. Preachers hit the biceps from a slightly different angle, and build a bulky peak. Using a good Preacher machine is best because the tension is constant, due to the mechanics of the machine. Hammer curls. 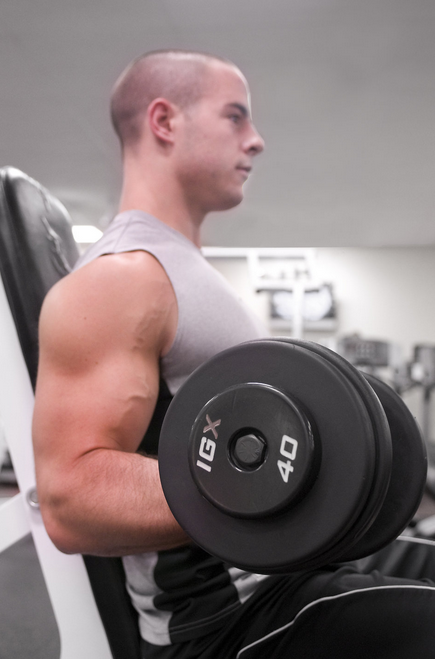 Hammer curls hit the brachialis: a small muscle that sits between the biceps and triceps and can make your guns pop. 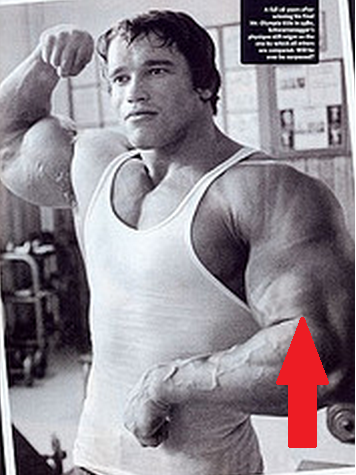 Arnie is famous for having great brachialis development (below). Concentration curls. These are a great way to finish off the biceps individually. Rest the back of your elbow into your thigh and curl. 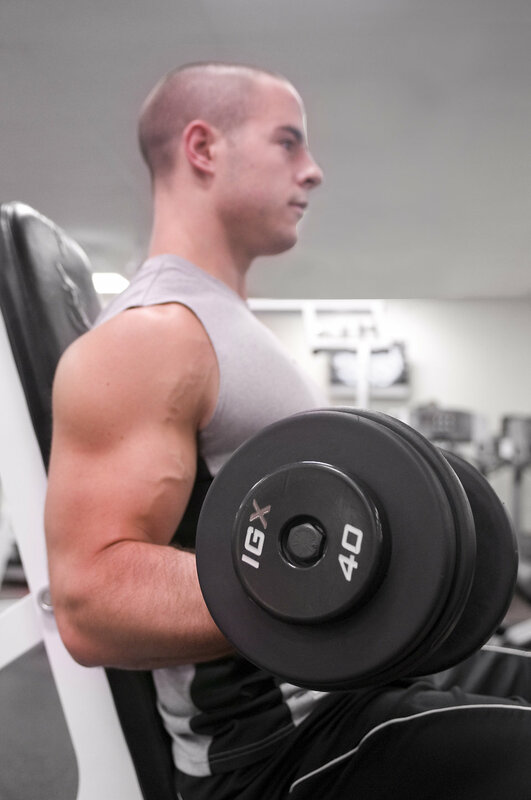 You can go to absolute failure with concentration curls because you can assist the curl with your other hand. Skullcrushers. Skullcrushers bust up your biceps. Lower the bar slowly, feel the burn, then powerfully extend your arms. TIP: You may prefer an EZ curl bar for comfort. Narrow-grip bench press. These are an excellent, multi-joint, compound lift for kicking growth into the belly of your triceps. Some people like to perform narrow-grip bench presses with their hands touching, but this places a lot of strain on the wrists. Using a grip with the fists about a hand-width distance between your hands is best. Concentrate the effort into the tri’s and don’t use pecs for pushing. Overhead dumbbell extension. Take a good sized dumbbell, hold it perpendicular to the floor, grip one end, and push it above your head. Drop it slowly behind your head and press back up. Sheer Strength Labs Ultra Pure Creatine Monohydrate helps power through that extra, muscle shredding rep or two to stimulate the muscle fibers. Forearm curls. You don’t see many people training the forearms on their own. Forearm curls are a great way to burn them out, but be careful as they can be harsh on your wrists. Kneel on the floor and rest your forearms on a bench, with your hands hanging over the side. Curl a flat bar using the full range of motion. Cables are an underrated commodity when it comes to arm training. They’re especially good at fully exhausting the biceps, due to the constant tension put on the muscle throughout the lift. Use Sheer Strength Labs BCAA’s before, during and after your workouts to protect your hard earned gains from unwanted breakdown. Overhead double bicep curls. These are excellent for burning deep into the biceps with constant tension… and they let you pull a double bicep pose. Stand in the centre of the cable crossover rack, take a stirrup type handle in each hand, and curl powerfully for a big squeeze at full contraction. Feel the burn as you extend your arms. Cable Preachers. Grab a preacher bench and set the cable low. Choose whichever grip suits you and curl. Feel the burn from the constant tension. A good Preacher machine will do much the same job. Rope hammer curls. Like normal hammer curls but with constant tension. Use a low cable with a double rope grip. Bring your hands together at the bottom of the movement and throw them wide at the top. Cable concentration curls. Again, as per the dumbbell version, but these give constant tension. Hold for a second at the top for a real squeeze. Overhead cable extensions. These essentially work the same way as the dumbbell version mentioned in the previous workout, but there is no rest at lockout. Stand with your back to a mid height cable stack, using whichever grip suits you. 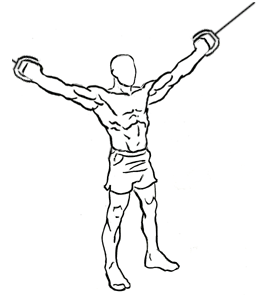 Extend your arms above your head and feel the squeeze at the top as the cable tries to pull your arms back down. Cable skull crushers. Once again, the same as normal skull crushers but with constant tension. Triceps press downs. Finish your tri’s off by hitting them with extensions from a third angle. Stand facing a high cable stack, attach whichever grip suits you, keep your elbows tight, lean forward slightly, and push down toward the floor. Lower the stack slowly to feel the burn. 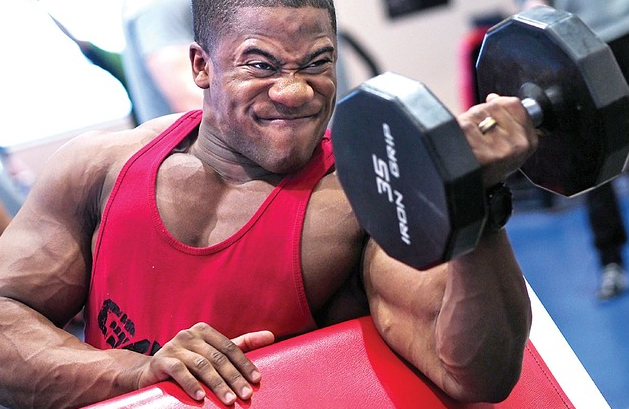 Supersets are an excellent way for high intensity and to kickstart some growth in your guns. For anybody that doesn’t know how to do supersets, you perform a full set of one exercise, followed immediately by a set of another. Performing supersets with antagonistic muscle groups (muscles that oppose one another) is the best way to get the most out of them. Biceps and triceps are perfect for this. Rest for slightly longer between sets due to the higher overall rep range and intensity. Take Sheer Strength Labs Sheer Alpha Testosterone Booster for increased intensity and a potent anabolic, muscle building environment. Packed with natural testosterone boosting ingredients, Sheer Alpha can really take your gains to the next level. This is a great combo for mass building and getting the blood pumping into your arms. Warm up on each, then aim for 10-12 curls, immediately followed by the same on the bench. Perform 4 supersets. Seated curls are a great way to eliminate using momentum instead of the muscles. Recline the seat slightly to hit the biceps from a different angle. Perform 4 supersets, starting with 12 reps each and dropping to 8. Finish off your arm supersets workout by combining these two burners. Squeeze at full contraction and really feel the muscles work on the way down. Perform 4 supersets, starting with 12 reps each and dropping to 8. If you alternate between these vastly different workouts, you can’t fail to pile slabs of muscle onto your arms. Mix it up to keep your muscles guessing and hit them with all the intensity you can muster. When your guns are fully cooked, use Sheer Strength Labs Sheer Recovery Post Workout Formula to help kick them into instant repair and growth. Packed with creatine, glutamine and muscle building BCAA’s, Sheer Recovery can help you make every workout count. The post 3 Workouts That Will Transform Your Arms appeared first on .